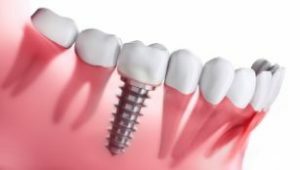 Implants are titanium posts that act as replacement roots for missing teeth. After the initial implant surgery has been done to place the implant, it’s given 3-6 months to integrate (or fuse) with the surrounding jaw bone. Then it’s completed with either a single dental crown, bridge or denture. These restorations are matched in size, shape, and color to your existing smile so they’ll look natural and blend in seamlessly. Will Anyone Be Able To Tell You Have an Implant? No one, not even you, will be able to tell you have a dental implant. Without question, they look, feel and function more like your own teeth than any other replacement option. In fact, the only way to discover a dental implant is to take an X-ray that shows the titanium post in the jaw. What Are the Cosmetic Benefits Of Implants? When someone’s teeth are extracted, their jaws begin to slowly “shrink.” Over time, this can give your face an aged, sunken-in appearance. Dental implants stimulate and maintain the jawbone to prevent this from happening and help you maintain a youthful facial structure. Visible empty spaces after tooth loss can make you want to cover your mouth when you smile or laugh. Dental implants will give you a full smile again that you’ll feel great about showing off. Implants provide fantastic benefits for your oral health. And, since no one will be able to tell you have an implant or that you’ve lost teeth, they’ll also restore your confidence as well! Dr. Gladston Silva is an implant dentist in Daytona Beach and a highly-respected Diplomat of The International Congress of Oral Implantologists. He knows that dental implants not only feel great but look great as well, and has seen firsthand what a positive impact they have on his patients’ lives. If you’re considering implants and have any other questions, he can be reached via his website.